You spend more time in your car than you think. It's not just your transporter between work and home, it's your little enclave during traffic jams, road trips, long highway stretches, and everyday appointments, shopping, and grocery trips. It's the one little mobile home that you can call your own in a sea (parking lot) of vehicles. 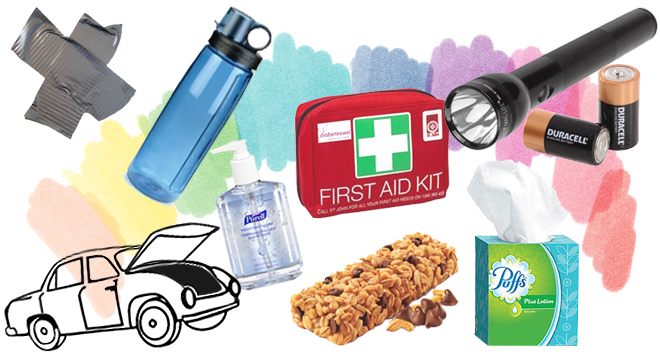 With all the amount of time you spend in your car, you should think about stocking your car with the every day essentials, not just in case of emergencies, but for comfort as well. We've prepared a list of must-haves you should have handy in your little automotive corner of the universe. You never underestimate the power of a cupholder; we know you can feel its absence when your theatre seats are missing a place to put down your drink, or when there isn't one right beside your car seat. But it also seems like there is a universal low standard for cupholders, where spills are inevitable. Have a box of tissues or a roll of paper towels ready in the backseat for any of these caffeine spills or carsick accidents. What else are you going to clean it up with? No matter how often we talk about the importance of water, it won't mean much unless you carry a waterbottle around. Instead of keeping plastic water bottles in your car (the plastic can break down, especially on hot days where your car is basically an oven), keep a BPA free water bottle and fill it with water. If you're really worried about plastic and want to be cool, use a canning jar with a tight lid. Glass definitely will not seep into the water. Mason jars: they have real practical uses other than trendy wedding decor. Whether you're feeling tired due to low blood sugar levels (dangerous while driving!) and just need a pick-me-up, or you just can't hold out until dinner, keep a box of snack bars ready in your car. In your desperate, hangry moments, that chocolate peanut bar will taste better than you ever remembered. Our sense of sight is important in any emergency, and as Plato has often pointed out, our vision is completely useless in the darkness. Happiness and survival can be found if you remember to bring your light source of choice (not all of us have Dumbledore's powers in our fingertips). Don't be dim-sighted and keep a flashlight handy in your car (glove compartment). Whether it's a headlamp, LED keychain, or something full-sized, it's helpful to have extra lights other than your phone's flash. And what use is a flashlight without batteries? Well, if you've got a Maglite, then you've got a defence weapon (bat or crowbar) as well. But insert a few D batteries into it and it'll work as a light source! Keep several spare batteries outside of the flashlight as well, so it won't die on you. Baton-crowbar-torch, bet your smartphone flashlight app can't do that. There's a saying, 'if your problem can't be fixed with duct tape, you're not using enough duct tape.' It can fix anything from acting as a Macgyver bandage to help with minor collisions. In a fast-moving metal vehicle on roads filled with other fast-moving houses of metal, accidents are not rare and somebody going to get a hurt real bad. Keep a first aid kit nearby; the best place would be in the glove compartment. In most cases, having a cell phone would be most important to reach emergency medical services, but for most injuries, a first aid kit could mean a huge difference while the paramedics arrive. Make sure your first aid kit includes scissors, absorbent compress dressings, bandages, cloth tape, antibiotic ointment or antiseptic wipe, aspirin, a blanket, breathing barrier (mask), an instant cold compress, gloves, hydrocortisone ointment, roller bandage, sterile gauze pads, and triangular bandages. Like your mother always said, 'you don't know where someone else's hands have been.' You're rarely going to have water readily available everywhere to wash your hands, and even then, you might not have soap. Whether your hands are tainted from shaking hands with someone under the weather, or sticky from that chocolate bar or bag of cheezies you had stashed away, keep a small bottle of hand sanitizer handy in your car. Also, quick life hack: you can use hand sani as an emergency armpit deodorant, it'll get rid of your sweat odour in an instant. Purell even has some that will fit in cup holders. Whether it's one of those little trees or a car vent clip, chances are you might need a bit of extra help to keep your car smelling clean. Even if you often keep the sunroof open or roll down the windows, your car is an enclosed space that quickly fills up with the smell of gym bags, body odour, cigarette smoke, food, or coffee spills. What other essentials do you always have in your car? Let us know in the comments below!